The weekend rains that rolled into Monday morning have complicated commutes as the work week starts. 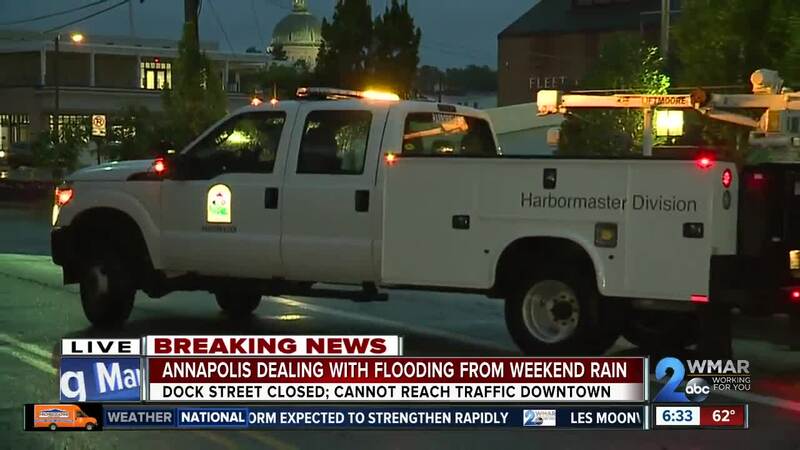 Flooding has caused street closures in Annapolis. At Saint Mary’s Street and Compromise Street there is visible flooding from the rains that soaked the city this weekend . Compromise has been closed between Memorial Circle and Saint Mary’s as a result. High tide hit at 6:20 this morning has added to flooding concerns as Annapolis officials closed Dock Street. There isn’t any access traveling from Eastport to downtown Annapolis. The city’s downtown traffic can reach Eastport by using Duke of Gloucester Street instead. The streets were closed off and on Sunday because of tidal flooding. Annapolis Police were able to re-open the lanes periodically as conditions improved, but they're expecting this to be a problem for the morning commute. The Department of Public Works has traffic alert signs out – one is on Bay Ridge Avenue and Hilltop and another is on the traffic island at Bay Ridge Road and Bay Ridge Avenue. These will direct drivers towards Spa road instead of using Compromise. Though the weather may be slowing drivers, residents determined to get in their morning workouts were undeterred as joggers navigating the wet roads. Annapolis isn't the only area dealing with effects from the wet weekend. The saturated ground also caused problems in Baltimore. A massive tree that was down in North Baltimore at Saint Paul Street and University Parkway, blocking traffic there. No injuries were reported. The heavy rain may also lead to some local flooding, as the Jones Falls was running high Monday morning in Mt. Washington. This area is known for flooding in heavy rain and this time is no different.